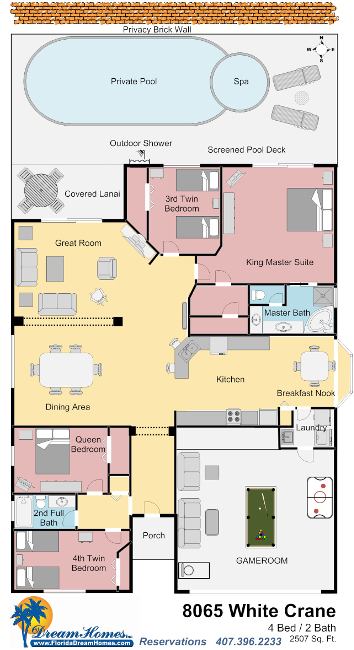 Property Size 2,507 sq. ft.
Great location for the theme parks. Great home for the night after. 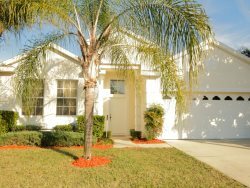 4 Bedroom/2 Bathroom Home with Private Screened Pool, Hot Tub, Gameroom, Pet Friendly, Master Suite, King Bed, Washer/Dryer, Fully Equipped Kitchen, Free Wireless Internet, Expanded Cable, Close to Disney. A Disney entrance is only 3.1 miles away. Sea World, Universal, and the Convention Center are approx. 15 minutes beyond that. Thanks for a great stay in a spacious in a nice home that had all we needed. When we had questions you were right there to resolve them with no wasted time. again thanks for a great stay! It was amazing stay , everything was clean and very organized , we just loved it , specially the swimming pool . Thanks for your organized job. We thoroughly enjoyed ourselves and anticipate staying in one of your properties in the future. I will also tell my clients about your properties and hopefully book their home through you. My family and I had an amazing stay at the home. It was very conveniently positioned to all the places we wanted to visit. I was also very happy with the provisions that automatically come with the house like the entertainment which is suitable for both adults and children. It was so perfect that I even looked hard for what was wrong with the house... I found nothing. We very much enjoyed our stay in this home during our recent trip to Disney. There was plenty of room for our group of 5 adults and 2 kids. Everything was clean, and there were plenty of dishes and pots and pans in the kitchen as well as updated appliances. The location was very close to Disney, and convenient to have a grocery store and restaurants nearby. The kids loved cooling off in the pool after a long day at the park. We discovered there is a Keurig machine as well as a regular coffee pot. We would have preferred to bring our own k-cups from home had we known the machine was there. The kids also enjoyed the game room, but were a bit disappointed that the basketball game shown in the video wasnt there. We will definitely use Florida Dream Homes again - cant wait for our next visit!